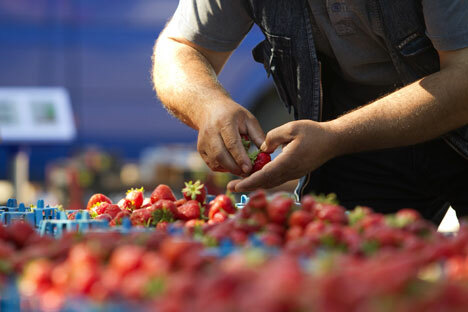 Russian markets have plenty to offer to their customers - fresh produce, variety and encounters with different cultures. RBTH presents this essential guide to help you navigate the best marketplaces in Moscow. The markets of Moscow have recently become a familiar topic for discussion in the Russian media. From trade rules violations to illegal immigrants and petty crime, many are the problems to tackle. As a result, it is often forgotten what real Russian markets are all about. RBTH presents this guide to help you get to know more about this Russian institution, identify the markets with the best produce, and learn some useful tips for a successful shopping trip. Russian markets are a multicultural environment. For a foreigner, they are an occasion to discover culinary traditions from various countries of the former Soviet Union. At the market people of many nationalities, once united in one state, showcase their specialties from pickles to berries and wild mushrooms, both fresh and canned. Russians from Voronezh, Lipetsk, Rostov and Kuban lay out fantastic pieces of salo (pork fat), bacon, sausages, and ham. For meat lovers the feast continues with the stands selling suckling piglets, veal and pork. The most delicious lamb and horse meat can be found at the stalls of the Dagestanis and Kalmyks. The most beautiful greens, varieties of cheese from the Caucasus and a wide assortment of sauces (i.e. tkemali, adzhika and satsebeli) make the Georgian sections particularly inviting. Azerbaijanis showcase proudly their fantastic pomegranates, persimmons, figs and grapes. Uzbeks and Tajiks offer a variety of dried fruits, spices and rice for the most exquisite pilaf and dolma dishes. If you want to get to know Russia and Russia's nearest neighboring states, to find out more about the geographical influences on their regional cuisine, to find the best ingredients – go to a produce market. Here you can watch, touch, smell, taste and haggle over the price. The best way to discover produce markets is at the so-called weekend fairs. These are small street markets, opening near subway stations on weekends, similar to farmer's markets in Europe and the United States. The trading is conducted directly out of small trucks. Here the selection is more modest than in the large permanent markets, yet you will find a good selection of meat, eggs, fish, varieties of cheese, sausages, fruits and vegetables. In theory, this is a place for agricultural producers to sell their goods, but it is not unusual to find retailers, whose stock consists of fruit and vegetables purchased in bulk from the nearest wholesale markets. Yet, you can still find plenty of real farmers here, such as beekeepers and manufacturers of sausage and salo, smoked meat, salted, smoked and dried fish. One of the best weekend fairs is the one held between the Prospect Mira and Olimpiysky subway stations. The counters of permanent markets, like those in the Bagrationovsky, Medvedkovo, Tekstilshchiki, and Tyopliy Stan areas, are more diverse. The rows of stalls at these markets resemble an oriental bazaar – semi-covered pavilions divided into small shops. Just like in a bazaar, things are not necessarily clean and pickpockets are often hiding out among the crowd, so it’s better to be on alert. Less well-off Muscovites usually go to such markets to buy food. One should be very careful when selecting goods here. Slabs of meat, for example, will be laid out to show all the good parts, and be packed in a film so that a keen buyer won’t see the defects. Vegetables and fruits behind glass might be beautiful, but not necessarily a good deal. Here the goods will be stored under the counter and weighed at the customer’s request. You will not be able to negotiate the price and won’t be allowed to touch the goods with your hands to determine the freshness of the food. Only if the products are laid out on an open counter you will be able to pick the products you prefer. In permanent markets you are most likely to meet farmers from the Moscow region. The big old covered markets, like the Danilovsky, Zamoskvoretsky, Cheremushkinsky, Rizhsky and Dorogomilovsky markets, are the market type of choice for the best restaurateurs in Moscow. There is a huge selection of produce, but the prices may be a little steeper than in chain supermarkets. This is compensated by the quality, selection and flavors. You can also buy everything you need for the banquet-worthy table, including dishes and utensils, and all sorts of culinary devices. Paid parking space is available, and you can use shopping carts or hire a porter. When visiting a Russian market there are a few simple rules that is always best to keep to mind. If possible, pick the food yourself – do not let the seller do it for you. If you are offered to try a product, don’t be shy and take a bite. And if no one has offered you to, don’t be afraid to ask! Smell, touch, watch, taste. Get acquainted with those sellers whose food seems to you to be of the highest quality. What you are selecting at a market is not just the product, but also the seller - be it a butcher, a greengrocer or a dairyman. Talk to the seller, ask about their health, and inquire about the best ways to cook a particular product. When you become a regular customer, the seller will keep the best things just for you, give you discounts and small gifts. A regular customer is always appreciated. Explore the market inside out, look around and ask for the prices. Note that prices are usually much lower down the side lanes. Do not rush immediately to the most visually attractive stands – the prices will be much higher, but the quality might be lower. If you like the product, ask for the price and then bargain for a lower one - buy only after you have executed the first two steps. Markets are good to visit in the morning, when the products have been just brought in, and the choice is huge. In the evening, when the sellers will be trying to sell the leftover goods before they go bad, you might be able to get a discount. One last suggestion - always make a shopping list. Given the wide choice and tempting products on display, it’s incredibly difficult to leave the market without buying something. It’s best to come prepared.